Objectives: The aim of this study is to determine the clinico-pathological features of primary gastrointestinal non-Hodgkin's lymphoma (GI NHL) at King Abdulaziz University Hospital, Jeddah, and to compare our results to those reported in the literature. Materials and Methods: Twenty-three adult patients with primary GI NHL diagnosed over a 5-year period (2000 through 2005) were retrospectively studied clinically and histopathologically. They were classified using the REAL/WHO histopathologic classification. Results: Of the 23 patients with primary GI NHL, 14 (60.9%) were Saudis, with a male-to-female ratio of 1.3:1. The mean age of male patients was 61. 3 years, ranging from 42-83 years with an SD of ±13.09; while for females, the mean age was 64 years, ranging from 50-75 years with an SD of ±9.14. Abdominal pain was the most common presenting symptom (78.3%), and the most common primary site was the stomach (73.9%), followed by the small bowel (13%). The most frequent histologic subtype was the diffuse large B cell lymphoma, accounting for 60.9% of all cases, followed by the marginal-zone cell lymphoma (MALT type), which was Helicobacter pylori associated (39.1%). A large proportion of patients with primary GI NHL had early disease (Stage IE - 20%, Stage IIE - 58.6%). With regards to treatment, 15 patients (65.2%) had chemotherapy, while only 2 patients (8.7%) were treated by Helicobacter pylori eradication. The overall 5-year survival was 47.8%. Conclusion: The data demonstrated that primary GI NHL is more common among males, mainly in their sixth decade. Abdominal pain is the most common presenting symptom, with stomach being the most common involved site. Diffuse large B cell lymphoma is the most frequent histologic subtype, followed by extranodal marginal-zone B cell lymphoma (MALT type), which was Helicobacter-associated. A majority of cases have early disease (stage IE and IIE), mostly treated by combination chemotherapy. Objective: The purpose of this study was to evaluate the impact of non-ulcer dyspepsia (NUD) on health-related quality of life (HRQOL), which was assessed using the Nepean Dyspepsia Index, the Short Form-12 quality of life (QOL) scale, the general health questionnaire (GHQ-30) and the self-reporting questionnaire (SRQ-20). 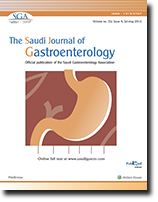 Materials and Methods: Validated Arabic versions of the four scales were administered to 158 subjects (54 with NUD, 50 with gastroesophageal reflux disease [GERD] and 54 with no history of gastrointestinal [GI] disease), with a mean age of 46.6 years and SD 10.7. Results: Subjects with NUD showed the poorest scores in all indices of general QOL and HRQOL. The differences between the NUD patients and the health control in all HRQOL indices were statistically significant ( P < 0.05 to P < 0.001). Comparison between NUD and GERD patients showed significant differences only in the indices of psychological health related QOL ( P < 0.05) but not in the indices of other components of QOL, including physical health components. The study also showed that the women scored lower than men in HRQOL indices, particularly those of psychological and mental health components ( P < 0.05 to P < 0.001). Finally, it was found that severity of symptoms is associated with the degree of impairments in HRQOL - (r = 0.69) was significant at ( P < 0.001). Conclusion: Results of our study showed that HRQOL was significantly impaired in the NUD group. Psychological and mental health related quality of life was particularly impaired in this group compared to both normal patients and patients with similar GI disease. This magnitude of effects on HRQOL was also found to be associated with the severity of symptoms. The implications of these findings for the management of NUD are discussed. Background : The aim of this study was to report the outcome of laparoscopic cholecystectomy in children with sickle cell disease and to compare the patients who had surgery as emergency with those who were operated as routine. Materials and Methods: A total of 72 patients (males 48, females 24) less than 14 years of age (ranging between 6 and 14 years) underwent cholecystectomy at the King Fahad Hospital, Hofuf, in the last 5 years. The records of these patients were reviewed retrospectively, comparing the outcome of surgery in emergency and routine cases. Results: The mean operating time and the mean hospital stay were longer in the emergency group (91.3 min, 8.5 days) compared to routine group (75.8 min, 4.5 days respectively), with high incidence of postoperative complication in the emergency group. Conclusion: This study showed that elective laparoscopic cholecystectomy by an experienced surgeon and taking necessary precautions are the safety measures to be recommended at the time of diagnosis of cholelithiasis in sickle cell disease children. Objective: To identify laboratory predictors of advanced fibrosis in Saudi Arabian patients with hepatitis B and C. Materials and Methods: Histopathology reports were obtained on all patients who had liver biopsy in the last 5 years, and relevant laboratory data were collected. Results: A total of 328 patients (246 with hepatitis C and 82 with hepatitis B) were included. With logistic regression analysis, four factors were found to be the best predictors of fibrosis, namely, platelet count, ALT, AST and GGT levels. An equation for calculating the risk of advanced fibrosis was developed. The model had a sensitivity of 62%, a specificity of 92.4% and an overall accuracy of 84%. Conclusion: Platelet count, ALT, AST and GGT levels were found to be the best predictors of advanced fibrosis on liver biopsy in Saudi patients with chronic hepatitis B and C. An equation was developed that helps in calculating this risk. We report a 19-year-old female admitted to the Emergency Room with excruciating right lower abdominal pain of 1-day duration. The abdominal examination revealed a soft, lax abdomen with rigidity and guarding in her right iliac fossa without abdominal defense. Apart from a leukocytosis of 18.3/mm3, the rest of her baseline investigations and imaging, including abdominal X-rays, abdominal and pelvic ultrasound and abdominal CT scan were unremarkable. Patient's persistent pain prompted the treating surgeon to undertake exploratory laparotomy, which disclosed an inflamed Meckel's diverticulum and a normal-looking appendix. Meckel's diverticulectomy along with appendectomy was performed. 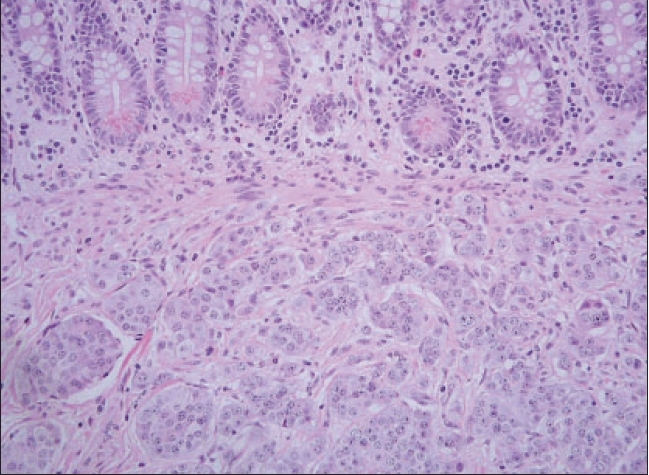 The histopathological report demonstrated carcinoid tumor in the Meckel's diverticulum with free resection margins, whereas appendix was reported to be normal. The patient had an uneventful recovery and was discharged home on the sixth postoperative day. 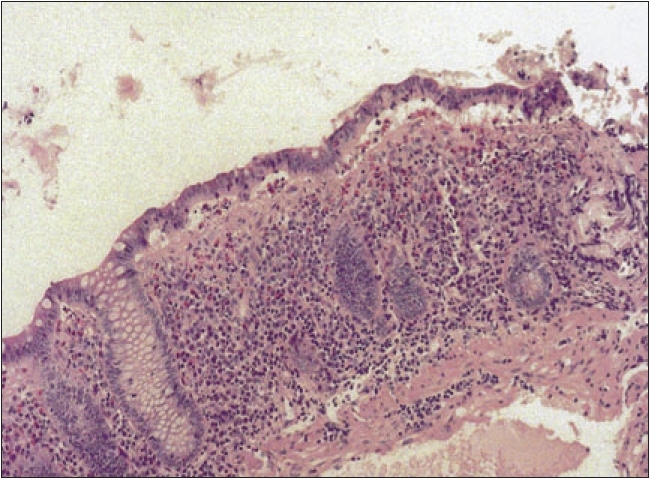 Microscopic colitis (MC) in both of its forms, collagenous and lymphocytic colitis, is considered now an important cause of diarrhea in middle aged and elderly patients. In this entity, endoscopic and radiological examinations are normal while specific histological findings are seen on colonic biopsy. Once the diagnosis of MC is confirmed, a stepwise approach with medical therapy is suggested. Ruling out other causes of chronic diarrhea should be the initial step. Once the diagnosis of MC is confirmed, a stepwise treatment algorithm is suggested. In this review, I will introduce the entity of MC and describe the stepwise approach to diagnosis and management by reviewing the available evidence. The literature was reviewed regarding both collagenous colitis and lymphocystic colitits focusing on clinical trails. This was then critically examined and an approach to the diagnosis and management of microscopic colitis was suggested. Hepatitis B is a crucial medical problem in Saudi Arabia. Different hepatitis B virus genotypes have been discovered and have been shown to cluster in different areas of the world. Hepatitis B virus genotyping has received a lot of attention recently, and its clinical implications are being investigated extensively throughout the world. In this review, we will discuss the virology, epidemiology and clinical implications of the different hepatitis B genotypes.